Yesterday summer gave us one last hurrah - a welcome break from what has been a dreary September. With sunshine, blue skies, and temperatures in the 70s (!!!) I made sure to spend a few hours outside, soaking up some Vitamin D while it's still possible. The wildlife highlight of the day was during a walk I took down at Mt. Finlayson. 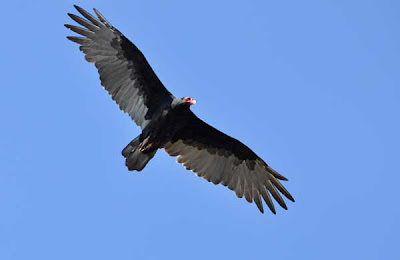 I was making my way along the hillside when all of a sudden seven turkey vultures erupted into the sky. I thought I might have startled them (they sure startled me! ), but as I looked closer at where they took off from I saw a fox had scampered up to the deer carcass they were feeding on, and that was what probably flushed them. I'm kind of surprised to still see so many vultures hanging around - I saw several others throughout the day, too. Surely they'll be departing soon for more southerly regions....if I was migratory the cold, wet, windy weather of this month would have been encouragement enough to depart early! I really shouldn't complain about the weather. Most of the rain has been coming at night (last night it was awesome to listen to what was a pretty spectacular downpour), making it nicer to get out and about during the daylight hours. This afternoon I took a short walk down at South Beach, where a few rafts of birds were just visible on the edge of the fog that never quite dispersed today. Most abundant were the surf scoters. There are a few Heermann's gulls mixed in to this flock, too. The main other bird sighting of note was a respectable three grebe species! Horned grebes and red-necked grebes have returned for the winter, and I also spotted a western grebe - a nice find.